Heartworm disease can have a devastating effect on your pet's health. National Heartworm Awareness Month, observed annually in April, reminds pet owners about the health dangers this preventable disease poses for pets. Thin, white heartworms look like cooked pieces of spaghetti. Male worms range in length from 4 to 6 inches, but females can grow as long as 12 inches. Heartworm disease is spread when a mosquito bites an infected animal and later bites another animal. The bite deposits tiny heartworm larvae into the animal's bloodstream. It only takes about six months for the larvae to mature into fully grown worms. Once the worms are mature, they begin to mate, producing even more heartworms. Why is Heartworm Disease So Dangerous? Heartworms invade your pet's lungs, heart and blood vessels and cause permanent damage that can shorten your furry friend's life. 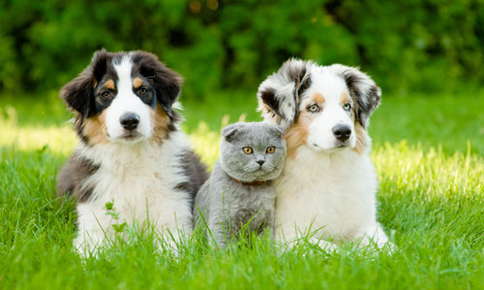 The disease is more dangerous in dogs than cats because fewer worms grow to adulthood in cats. A dog can be infected with more than 200 heartworms, although the average is 15 to 30. Cats may only have a few mature worms or might only be infected with immature worms. Heartworms can live five to seven years in dogs and two to three years in cats, according to the American Heartworm Society. What Are the Symptoms of Heartworm Disease? In the early stages of the disease, there may be no obvious changes in your pet's health. As the worms grow and multiply, you may notice that your dog begins to cough. Their cough will gradually worsen as the disease progresses, and you may also notice that your pet tires easily and has difficulty breathing. A large number of worms in a dog may trigger a condition call Caval syndrome. The syndrome occurs when a bundle of worms prevents blood from flowing back into the heart. Emergency surgery is necessary to prevent death. Coughing and a decrease in activity is common if your cat has heartworm disease. Other possible symptoms include vomiting, diarrhea, lack of appetite and weight loss. You may notice that your cat isn't quite as active as usual. Even if your cat only has immature worms, its health can still be affected. Heartworm associated respiratory disease (HARD), a common problem in cats with heartworm disease, occurs when your pet's lungs become inflamed due to the death of immature worms. If your pet has HARD, it may cough, wheeze and have trouble breathing. Unfortunately, it's not always easy to tell the difference between HARD and feline asthma. How Is Heartworm Disease Treated? Drugs are available to kill both mature and immature heartworms in dogs. Because the medications are very strong, they can cause blood clots and other complications, in some cases. Your dog will also require frequent tests during heartworm treatment, such as blood tests and X-rays. The medications that kill heartworms in dogs are too strong for cats. Instead, your vet may recommend medications that treat your pet's respiratory and heart symptoms. Corticosteroids can be used to decrease inflammation, while bronchodilators will help your pet breathe easier. It's much easier to prevent heartworm disease than it is to treat it. Although pets that spend time outdoors are at increased risk of mosquito bites, it only takes a second for a mosquito to fly through an open door and bite your indoor cat. Prescription preventive medications, available for both cats and dogs, offer a simple way to protect your pets. Before prescribing preventive medications, your veterinarian will test a sample of your pet's blood. Blood testing is necessary to ensure that your pet isn't already infested with the worms. If preventative medications are given to a pet that has active heartworm disease, complications can occur. Preventive medications are available in pill, topical liquid or injections forms. Pills and topical liquids are monthly treatments, while injections prevent your pet from heartworm for six months. Because heartworm preventive medications are only available by prescription, it's important to make annual veterinary checkups a priority. A delay of a just a month or two can put your pet at risk of developing this deadly disease. Is your pet protected from heartworm disease? Call us today to schedule your furry friend's checkup and blood test. Sign up using the form below or call 772-219-8022 to make an appointment. "Surfside is considerd to be my family and friends. Trust and a genuine heart fills the entire staff. Professional expertise has kept my fur kids healthy and very happy....Thank you for all you've done & continue to do....Kindest regards!"